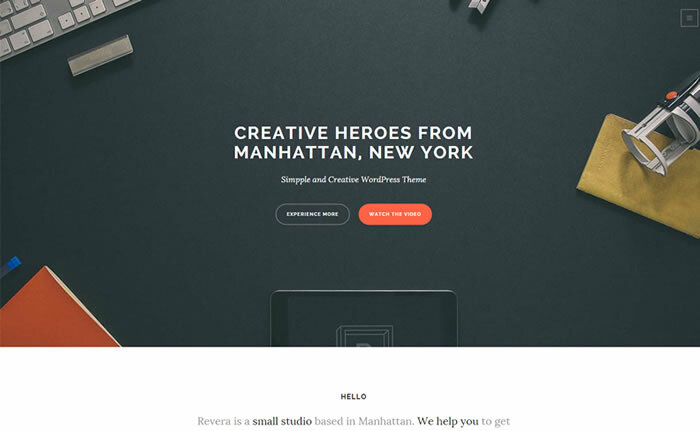 Revera is light weight & simple, creative one page portfolio WordPress theme included with hero section supports fullscreen background image, YouTube video (with autoplay) and image sliders. Enabled to support one page / multipage layouts and built with left / right / horizontal or off canvas navigation options. Choose the best suitable layout model and navigation options from above available options for your website. Revera theme has 100% responsive layout, retina display ready looks great on all kind of device displays such as laptop, tablet, smartphones and suitable for business, portfolio, creative agencies, freelancers and personal websites. Revera one page portfolio WordPress theme built using modern HTML5 / CSS3 code standards and bundled with Visual composer ($33) premium WordPress plugin helps you to build professional looking posts / pages on fly without hacking single line of code. Included with .PO and .MO files is very handy translate website in your preferred languages and enabled with maintenance mode option, should be very useful feature whenever you are renovating your website. Unlike other one page WordPress themes, Revera is fast loading theme coded with best SEO practices helps you to rank well in search engines like google and bing.